I’ve written a few posts now on tools: There was the one on Doing a Site Audit Using Google Webmaster Tools, the 8 Alternative Ways To Use Screaming Frog for SEO and most recently one on Simple Tools to Get More Done. But recently I’ve been using some tools that don’t really fit into the topics I’ve covered previously so I thought I’d write this post. Credit for finding this tool goes to Bridget Randolph who found this while checking if a client had been hit by any of the Panda updates. Normally, I just refer to the SEOmoz Google Algorithm Change History page but there’s been so many updates that I find it annoying to jump back and forth between windows to check the dates. This plugin means I no longer need to do that. It’s a plugin for Chrome and can be found here. It overlays Google updates onto Google Analytics data, below you can see example data with the Panda updates highlighted. The arrow shows the icon that shows up in GA when this plugin is installed. Clicking on it brings up various options to overlay, the most useful being the Google updates but it can also be used to show public holidays or even your own private data if you are willing to do some customisation. If, after using something like the chart intelligence plugin, you find out that your site has been hit by a penalty - for example, the Penguin update - deciding which links to remove can be a painful and slow process. To help with this, lately I’ve been using the Link Research Tools suite. They have too many tools to explain in a single blog post but I’ve been using one in particular; the Link Detox tool. Cleaning up a bad link profile is a very labour intensive task, Link Detox helps scale this by allowing you to upload a list of backlinks that point to your site and telling you which are potentially harmful. They use a variety of methods to do this, the most basic being things like checking if a domain is indexed and if it has PageRank. Links are then classified as being either Toxic (these should be removed) suspicious (these could potentially be dangerous) or healthy (no action is needed). The output of the tool is partially shown below. No link classifying tool will be perfect so always have a quick look at the results to make sure there are no obvious mistakes. As a general rule, I normally find the toxic links are accurate enough but I’ll still always give them a once over to check for glaring errors – better to be safe than sorry. Keeping with the link penalty theme, the next step in the process would be to remove as many of the links that were cateogrised as toxic and potentially the suspicious ones. Again, this is a very manual and time consuming process so I’ll always welcome any tools that can help automate or speed that up. Thanks to Cyrus Shepard for writing a blog post on tools for easy link cleanup which brought Rmoov to my attention. All of this information with notes on who and when you emailed the sites is saved in a gdoc which you can then include as a reference in your reinclusion request. Note - Don’t ever pay someone to remove a link, just include that they wanted to charge you in the reinclusion request and add them to the disavow tool; that’s what it’s for. Optimizley is my weapon of choice when it comes to conversion rate optimisation. It has a lot of the same features as many other CRO tools out there with one big difference; I don’t need to ask a developer to make the changes. When it comes to crawling websites, I’m a big fan of Screaming Frog but the one downside is that I’m limited by the performance of my computer. Crawling more than 100k pages is challenging. This is where I turn to DeepCrawl; it’s worth noting that DeepCrawl is very much an enterprise tool so comparing it to Screaming Frog isn’t really a fair comparison. DeepCrawl is an enterprise level cloud based crawler that allows you to crawl into the millions of pages without using your computer's processing power or even your office IP. The interface is very easy to use and what I love about it is the ability to share problems with external developers or other members of staff. For example if I have a list of 404 pages, for a developer or client to be able to fix them, they need to know where they are being internally linked from. With DeepCrawl I’m able to simply copy and paste the link to that report and other people are able to not only see the 404 pages but they can click through and find out where those pages is being linked from as well as other information. I love it. The image below shows the dashboard style report that you get after a crawl. Before during and after a link removal project you’ll want to check if links are in fact removed or if they are still live. Doing this manually isn’t a good use of your time but it needs to be done. ScrapeBox has a plugin called “Do Follow Test”. It allows you to upload a text file with the URLs of the links you want to check. You then add your domain and press start. It’ll then go and check each of the URLs for links to your client and tell you if they’re still there, but also whether or not the links are nofollowed. You can see an example of this below. As I mentioned earlier in the Link Research Tools section, two of the most basic checks you can do to check if a link is toxic or not is to check if the domain is indexed and if the home page has any PageRank. It’s rarely as black and white as that but it’s a good place to start. Scrape box has a feature to check both very quickly. 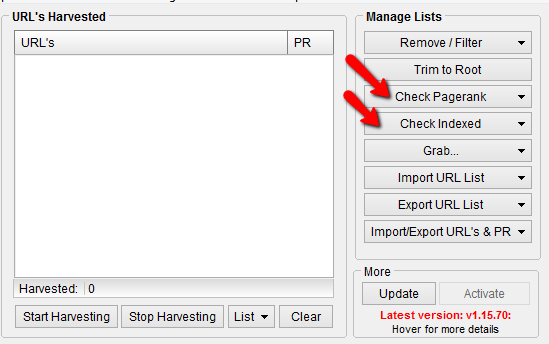 Just paste a list of URLs that you want to check in the URLS box and press either of the buttons shown on the right of the image above. The full list can then be exported. These can then be exported to a text document or in my case I want to check if those pages are all indexed. 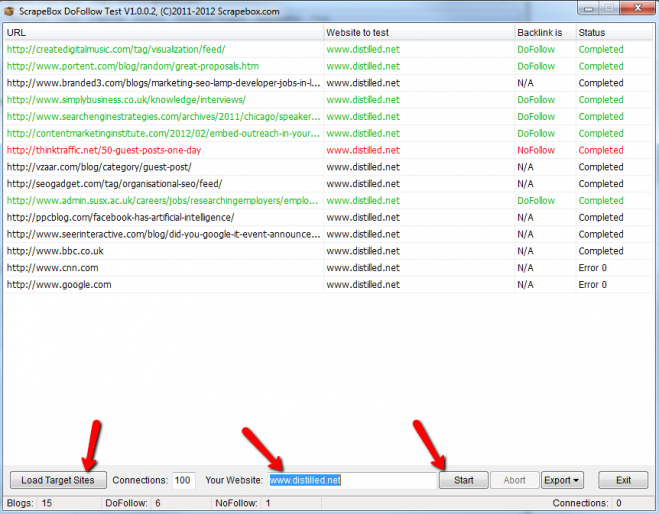 To do this I press “show extracted links” click inside the box, select all and copy the full list of URLs. 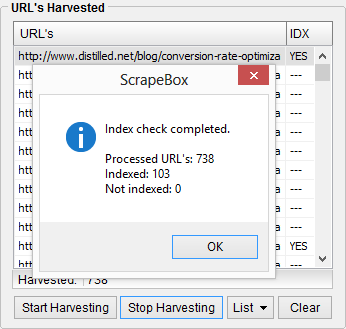 I can then go back to ScrapeBox and paste the full list into the URL box again and hit “check indexed”. I’ll then get a list of all the pages in the sitemap that are indexed or not as shown below. These are just some of the tools I’ve been using recently. If you’ve got suggestions for other tools that I’ve not heard about, please feel free to add them to the comments. Also, I’ve written a similar post on SEOmoz about some single purpose tools and tools to make you work more efficiently, you can read that here. Thanks for reading and don’t forget to comment.